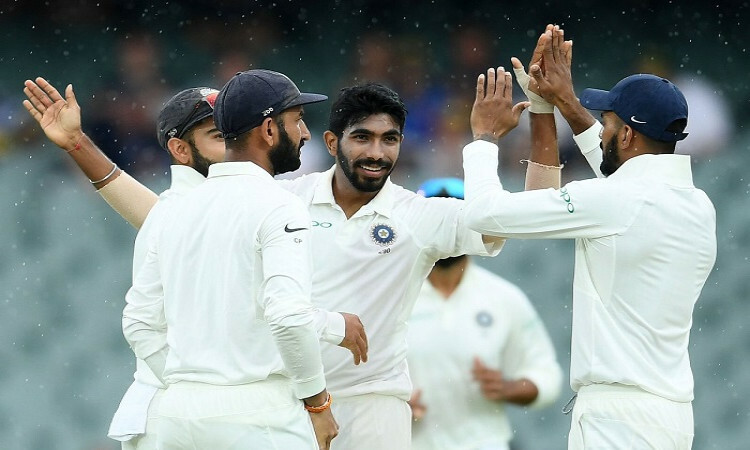 Adelaide, Dec 8 (CRICKETNMORE): India gained a slender 15-run first innings lead after dismissing Australia for 235 in a truncated first session of Day 3 of the opening Test at the Adelaide Oval here on Saturday. Resuming the day from their overnight score of 191/7, the hosts managed to add 44 runs before the Indian pace duo of Jasprit Bumrah and Mohammed Shami sprang into action to get the final three wickets. As soon as the new ball was taken this morning, Bumrah got rid of the overnight batsman Mitchell Starc (8) to claim his third wicket, before rain interrupted play for a while. Coming back after an almost an hour of rain interruption, off-spinner Nathan Lyon (24 not out) came out to bat, in the company of Travis Head (72), the other overnight batsman. Lyon batted aggressively and had the Indians in knots as the eighth wicket stand yielded 31 runs before India skipper Virat Kohli introduced Shami into the attack. From there on it was just a matter of time as Shami, who went wicketless on Day 2, ended Head's 167-ball vigil by getting him nicked behind to stumper Rishabh Pant, for 72. Shami struck again the very next ball to claim No.11 Josh Hazlewood for a duck to hand India a slim 15-run psychological advantage. For the visitors, Bumrah and off-spinner Ravichandran Ashwin emerged the wrecker-in-chiefs with three wickets apiece while Ishant and Shami bagged two scalps. With around 15 minutes of play before lunch, the Indian openers -- Lokesh Rahul and Murali Vijay stepped out of the dressing room but were sent back as it started drizzling once again. Brief Scores: India- 1st innings 250 (Cheteshwar Pujara 123, Rohit Sharma 37; Josh Hazlewood 3/52) vs Australia - 1st innings 235 (Travis Head 72, Peter Handscomb 34; Jasprit Bumrah 3/47, Ravichandran Ashwin 3/57).